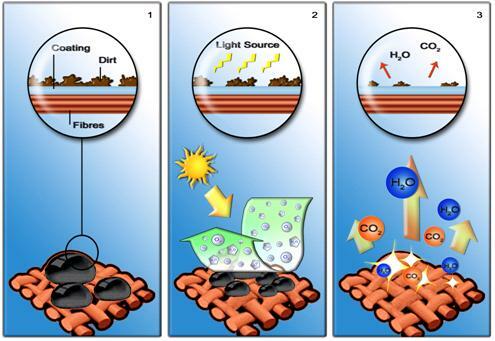 Self-cleaning Textile that uses light to Clean Itself - Something New Everyday! The era of the washing machine may soon come to an end, thanks to this self-cleaning textile that uses light to rid itself of dirt and grime. "There's more work to do to before we can start throwing out our washing machines, but this advance lays a strong foundation for the future development of fully self-cleaning textiles," says Dr Rajesh Ramanathan, co-author of the study published in the March 2016 issue of Advanced Materials Interfaces. The research team dipped the textiles into a few different solutions of copper and silver-based nanostructures, which are known to absorb visible light. After about 30-minutes, nanostructures grew directly and settled onto the textiles. When light hits the textile, it receives an energy boost and creates "hot electrons." Once these "hot electrons" are activated, they develop the ability to break down organic matter. "The advantage of textiles is they already have a 3D structure so they are great at absorbing light, which in turn speeds up the process of degrading organic matter," says Ramanathan. 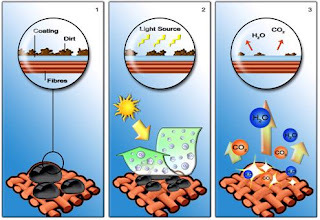 Aside from scaling up the project, the team is also working on how effective these self-cleaning textiles would be against common stains, such as tomato sauce.